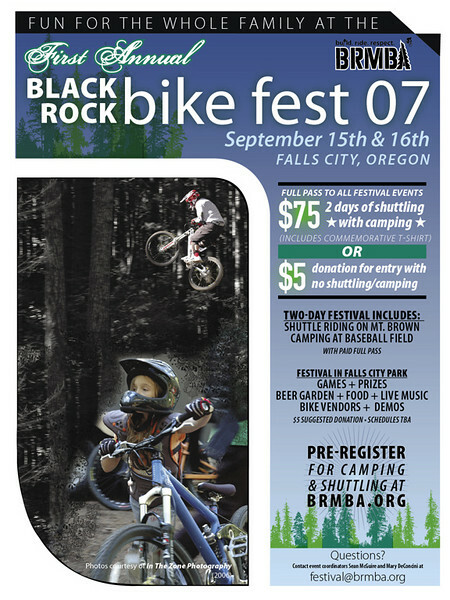 Bike Festival hosted by Black Rock Mountain Bike Association in Falls City, Oregon. Festival venue is in city park in Falls City (Mitchell & Park Street). Music. Food. Beer garden. Festival games (including "Huffy" toss). Downhill shuttling will take place up on the Black Rock trails (3 miles west of Falls City). See https://BRMBA.org for more details. Pre-registration required for shuttling/camping. Hey, want to help spread the word? 1) Download full-color flyer PDF (4Mb) from https://brmba.org/files/event/2007BR_poster8.5x11.pdf 2) Print. 3) Distribute!